Earth Friendly Maryland’s substantial plates and forks were used to support heavy hors d’oeuvres at a theater benefit auction gala. If you like to be gentle with planet Earth, you might be thinking of ways to “green your gala.” Adapting your plates and utensils is a good start. These items were for events that forewent a sit-down dinner and instead served heavy hors d’oeuvres. At a Girls Inc. benefit auction gala I worked a few months ago, the menu consisted of thick crab dips, cheeses, finger food, and the like. 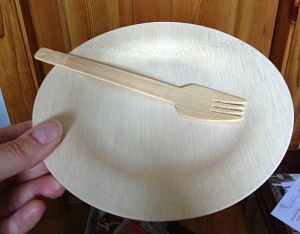 Showing off the food were these plates and utensils from Earth Friendly Maryland. My take on it? These plates were so substantial, they could have supported the weight of a steak! Unfortunately, the fork wasn’t as cooperative. The prongs were too chunky to pierce anything. The food wasn’t all that delicate, so it didn’t require much manipulation. I used the fork as one might use a shovel. 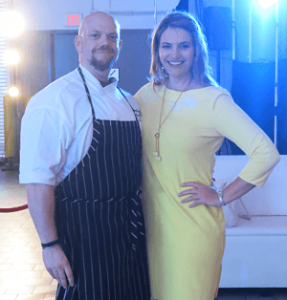 I saw a different style of dinner and flatware last spring at a fashion show auction hosted by a hospice group. Executive chef James Barrett of The Westin Annapolis brought fabulous hors d’oeuvres and soups, showcasing them on several styles of sustainable trays, bowls, and so forth. These pieces were not the quality of the other vendor, but they worked fine for his food. He mentioned his supplier was in New York. I especially liked all the fun shapes of the containers. 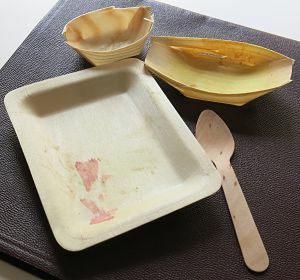 Little “boats” and trays were all used to display his food in visually attractive ways. If you’re hoping to make your gala more earth friendly, you might wish to consider these benefit auction ideas for appetizer-style events. VIDEO: Chairing a school auction? Your marriage may suffer. you ideas are good, Sherry Truhlar, and sustainable.